The Alabama Crimson Tide "13" Riddell Pro Line Authentic Helmet is just like the college players wear! This is an officially licensed Riddell helmet that measures authentic size and weight with a complete interior pad set. 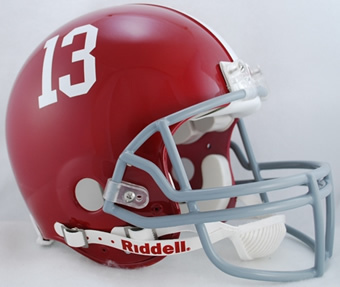 Alabama Crimson Tide "13" authentic collegiate helmets have official game style team decals and colors, along with authentic steel polyvinyl coated faceguards. Get your Alabama Crimson Tide "13" Riddell Pro Line Authentic Helmet today!